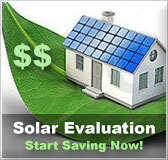 Utah residential solar energy incentives | Solar Panels | Solar Power | Site Map | Bookmark This Site! The investment tax credit for residential systems is 25 percent of the equipment and installation cost up to a maximum of $2,000 per residential unit. Eligible residential systems include active and passive solar thermal systems; solar electric systems; wind turbines; hydro energy; geothermal heat pumps; direct-use geothermal; and biomass. Credit may be carried over up to four years if unused, but the credit is nonrefundable. Residential customers of Questar gas who purchase and install solar water heating systems in their home are eligible for this rebate. 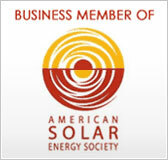 Customers who install solar panels to assist their gas water heaters will receive a rebate of $750 per system. Customers must include a receipt or invoice that shows the date of purchase, description of equipment and price with their applications to qualify. 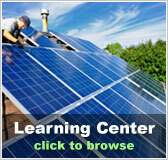 Customers of Rocky Mountain power who install photovoltaics are eligible for this incentive program. 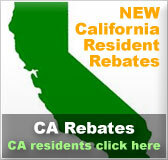 Through December 31, 2011, residential customers will receive rebates of $2.00 per watt (AC) up to $6,000. The program is limited to a total of 57 kW for residential per program year. Eligible systems may not be greater than 25 kW and must be net-metered. Pre-installation and post-installation inspections as well as a utility safety inspection will be conducted to ensure the system is installed properly. If the total annual production of the PV array is reduced by more than 25% due to shading applications will be rejected. So be sure to place the photovoltaics accurately. Customer-generated electricity may be from solar, wind, small hydropower, or fuel cell systems of up to 25 kW in size. The utility will "net" the customer's electricity use and production over the monthly billing period, in essence, paying the customer retail price for the electricity they produce. If net metering results in excess customer-generated electricity over the billing period, the utility will credit the customer for the electricity at the avoided cost rate. The customer may use the credit to offset purchases of electricity during future billing periods in the same energy year (April 1 – March 31). Any unused credits expire at the end of the energy year.